The company is planning to replace two kilometres of water pipes between Ludlow Food Centre and finish near Felton Farm. The work will start on 9 January and continue for 5 months. A drop-in session will take place in the Board Room at The Clive near Ludlow Food Centre on Wednesday 13 December between 3pm and 7pm. “A reliable water supply is so important to everyday life and the existing pipes have been in use for some time which is why we’re carrying out this work now, to avoid leaks and bursts happening in the future. 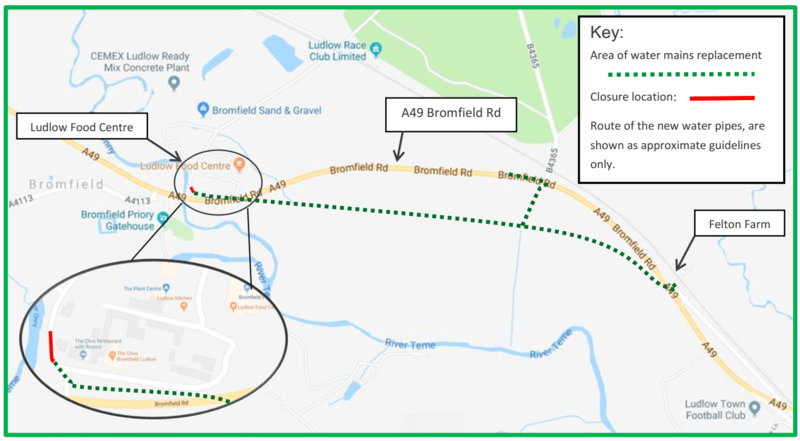 Most of the work will take place on private land alongside the A49 Bromfield Road, although there will be times that temporary traffic lights will be required to provide access for the engineers. The work will begin on 9 January and is expected to be complete by 22 June 2018. Towards the end of the project, Severn Trent will put a temporary closure on the road leading towards the quarry from the A49 to allow engineers from Amey to work safely. Updates will be available once the work is underway.